One can never have enough gauges...I liked to think in the beginning. I have somewhat modified my thinking on this since installation of the Apex'i Power FC. The Power FC Commander has readouts available for real time monitoring of essentially all major engine parameters so the need for a plethora of gauges essentially goes away. However, there are several parameters that are missing or that one needs in plain sight, for example boost pressure. My car currently has gauges for boost pressure, in a Pettit column mount, and coolant temperature and Air/Fuel ratio, in a dual A-pillar mount. As I mentioned, the boost pressure gauge is a necessity, however the coolant temperature gauge is no longer needed now that the PFC duplicates this information. It will be replaced with with an EGT gauge eventually. The A/F ratio gauge is really just a pretty light show but does provide some basic information that is useful to a certain degree. So what else is left? With the installation of the PFC (and in the days of data logging with my old PFS PMS) One parameter I would monitor closely was fuel injector duty cycle. Running with the ECU set to a max boost of 12psi, injector duty cycles would bump up to 90% and sometimes higher which prompted the installation of a larger fuel pump. How would I know if my fuel system was capable of handling this kind of fuel demand? A fuel pressure gauge - add this one to the list. The next parameter we all watch closely is engine coolant temperature. Now consider that engine oil functions not only as a lubricant but also as a coolant and it becomes apparent that it might be worthwhile to monitor oil temperature as well. Thus I felt an oil temperature gauge was in order - add this one to the list. 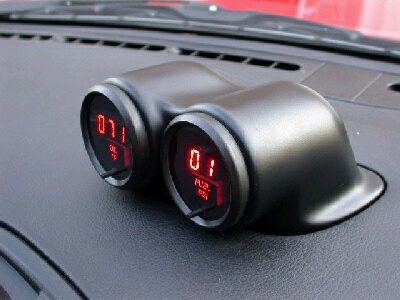 My choice for gauges were Nordskog digital "street" gauges with peak hold functions. Nordskog has a pretty good reputation in the marine and aviation industry and the digital line of gauges was fairly inexpensive. And when the car is turned off the blacked out faces of the digital gauges are less obtrusive (and less ricey IMO) to bystanders who might be "curious" about my car. The oil temperature gauges (PN M9008) has a range of 0-350degF, and a high temp peak hold function and the fuel pressure gauge (PN M8034) has a range of 0-100psi, and a high *and* low peak hold function. Both were $35 each from Summit Racing. The sensors were purchased separately (from Summit Racing also) - oil temperature sensor (PN S8013) for $15 and the fuel pressure sending unit (PN S8434) for $35. 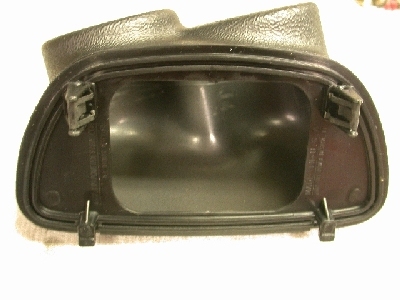 The gauges are fully electronic and require no routing of oil or fuel lines into the cockpit of the car. With gauges chosen the question then becomes where to put them. With the traditional three spots on my car are already filled and given I have the OE CD player/tape deck in the DIN location I was out of options. Long ago I had seriously explored fabricating my own dash top dual gauge holder to fit where the center speaker was located after seeing a Japanese product for right hand drive cars and had even gone so far as to purchase the fiberglass cloth and epoxy/resin to get started but never managed to find the time to undertake the project. 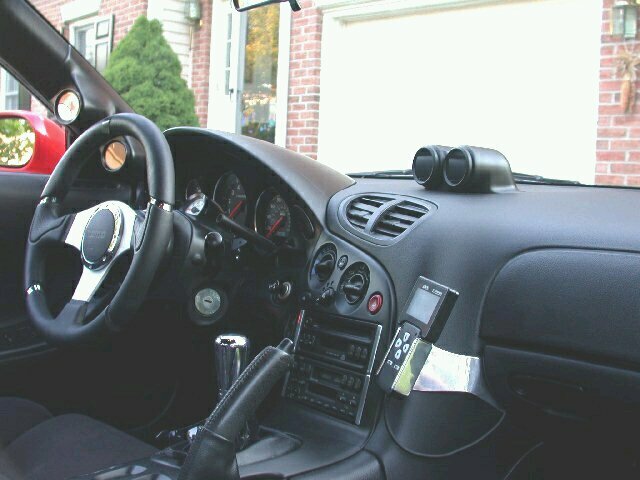 And then along came the TriPower dual dash top gauge pod. It was pretty much as I had envisioned. 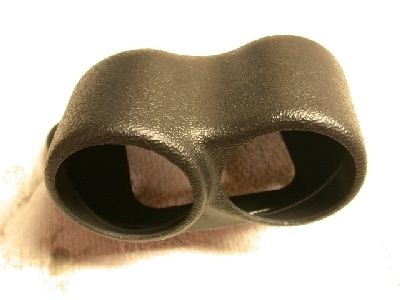 The shape differed slightly but the mounting principle was identical, i.e.. using the factory clips. And furthermore the TriPower pod was made of ABS plastic vs my "to be fabricated" fiberglass version. for wiring and factory clips. The pod as delivered...with nasty wrinkle textured finish. This sounded like a winner...until I saw the price - $100! YEEEOWW! Well, getting lazy in my old age I decided to get one anyway and even though it is ludicrously expensive for what it is ($5 worth of injection molded plastic) it is perfectly made and fit perfectly too. A rarity in today's RX-7 after-market. However, as with most gauge pods it comes with, IMO, a crappy looking wrinkle finish that doesn't match the smooth interior pieces of the car. 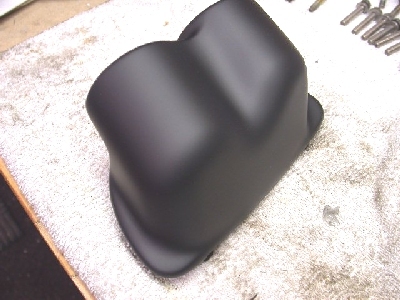 So similar to what I've done with my A-pillar pod, the TriPower pod was sanded completely smooth and shot with a couple coats of black (choose black and not gray so in case it gets chipped or scratched it won't show the mark as much) sandable primer and then some flat black lacquer to give it a look and texture identical to the factory main gauge cluster hood. Installation was easy. The speaker grill is removed by prying up the front of the grill and the mini-speaker is held in by three screws. To unplug the speaker harness you need to scrape off the foam to see where the catch is to unplug the connector. The center speaker is pretty useless anyway and I haven't noticed much in the way of sound degradation from the OE non-bose stereo in my car with it now removed. And then it's time to move onto installation of the gauges. Refinished pod to match the interior trim texture. Installing the oil temperature gauge required some thought as to where to place the sensor. There has been much debate over the optimal location for getting temperature values but there is a degree to practicality that I had to consider. I was not going to tear half my motor apart to get the sensor installed in the "best" location. I decided that the best option for me when all things were considered was near the oil filter on the oil cooler return line. Plus this would allow me to compare values with several friends who have the sensor placed in the same location. The sensor is mounted in a specially designed manifold (PN 11802) sold through Mazdatrix for $48 plus S&H (although I think it's actaully a Racing Beat part). It is however designed specifically for the 2nd generation RX-7 so some minor work is needed to make it fit. The oil filter tower removed and the sensor manifold w/sensor and plug installed. Longer studs (next to manifold) to replace shorter studs in the tower. To install the manifold the oil filter is first removed. Then the oil cooler return line banjo bolt is removed and the oil line disconnected. 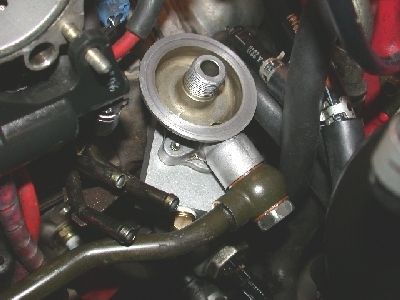 The sensor manifold is mounted between the oil filter tower and the engine block. The oil filter tower is held onto the block with 2 10mm nuts. Once the oil filter tower is removed the two short mounting studs in the tower need to be removed and the longer studs supplied with the manifold are installed. At this point I also installed a pipe plug in the manifold port where an oil pressure sensor could be used and installed the oil temperature sensor in the other port. The temperature sensor must be mounted without using any kind of pipe thread sealant or else it will not be grounded adequately! Then it's just a case of reassembly using the new oil O-rings. Be sure to mount the manifold correctly to ensure unrestricted oil flow...it only goes on one way! Remember to pre-oil the O-rings also. The tricky part then came when reconnecting the Oil cooler return line. It's too short - by about a 1/2 inch! A little bit of tugging and it can be reconnected. I found it helpful to disconnect the three fuel lines in the vicinity to allow better access to the banjo bolt. Oil filter tower installed with manifold in place and oil line reattached. Note the three fuel lines (lower left) disconnected for access. 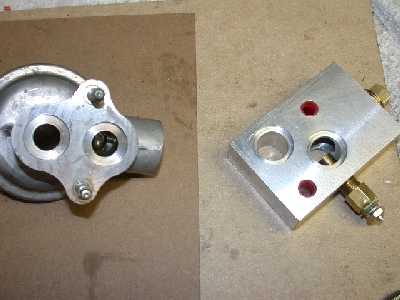 Fuel pressure sending unit mounting bracket. Next up was the fuel pressure sending unit. This required a bit more thought. The sending unit is "T"ed into the high pressure feed line running from the fuel pump - makes sense. The problem is the sending unit must be grounded so it cannot simply "hang" on the fuel line. That in addition to the fact that things were getting mighty crowded in the location of the fuel lines. So I decided to "hard" mount the sending unit to the chassis in a remote location and run a short piece of fuel line from the "T" to the sending unit. The sending unit is mounted to a small aluminum bracket I fabricated that bolts to two prethreaded bolt holes where the cruise control servo motor would mount (I have an R1 model so no cruise for me!). To isolate vibration I used two rubber "washers" between the sending unit and the bracket and between the bracket and the chassis. This, however, necessitated hooking up a, short 3 inch, dedicated ground wire form the sending unit body to the chassis. 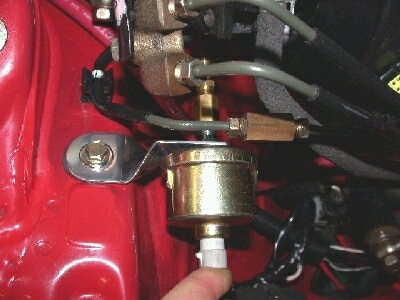 With the sending unit angled slightly down a length of fuel line barely 4 inches long is needed to connect the sending unit to the fuel line "T". 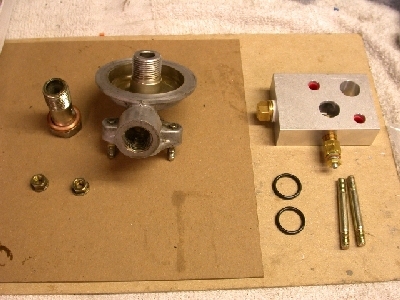 As for the hardware, I explored -AN fittings and determined that the price was prohibitively expensive so I settled on some simple brass fittings from a local speed shop for the sending unit and a brass "T" for the main fuel line connection. $10 vs about $50 for the - AN stuff. Be sure to use high pressure fuel line clamps and not the worm gear clamps if you choose to use rubber high pressure fuel hose like I did. And that takes care of the fuel pressure sending unit. 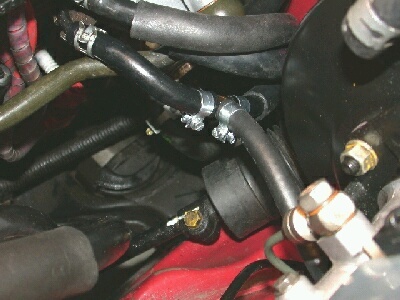 Fuel line "T" location and stubby pressure line to the sending unit. Then it was just a case of running all the wires. In order to facilitate easy removal of the dual pod gauge cluster, or an individual gauge if needed I wired in two 4 pin connectors, one for each gauge. The 12v gauge hot leads for each gauge I wired into a dedicated "fused" switch I installed when setting up the shift light. The gauge ground leads were run to a chassis bolt holding the brake pedal assembly to the chassis. The sensor leads were of course spliced into the wires running from the sensors themselves. The fuel pressure sending unit ground wire was grounded to the same location as the sending unit body ground wire. The only wire left unattached are the "dimming" wires used to dim the gauges at night when the lights are turned on. The digital LEDs are very bright at night but I at least have the switch so I can turn the gauges off completely if they becomes too bothersome. As for the results I'm very pleased. The pod looks like it was made for the car. The gauges look pretty slick and definitely low profile when blacked out and the readouts are clear and legible when turned on - great for the track.